Is Somalia ready for aid? The United Kingdom has unleashed a show of support for the country’s newly established government in the lead up to the conference, with moves such as the re-opening last month of the British embassy in Mogadishu, closed since 1991. That gesture ignited expectations of more funding for Somalia, including from other donors like Ireland, which has recently shifted its focus to fragile states. With this comes the question then: Is it time for donors to start pouring aid into the conflict-torn country? “Yes and no,” said Nana Ndeda, a spokesperson for a consortium of Somali NGOs that welcome the increased international attention on the state, but are concerned about the fledgling government’s control over finances and the accountability mechanisms in place. “I think the country is at a stage where more support given is better, but NGOs feel this support should be actionable and based on something that is tangible. We should not make the same mistakes we made in the past, where we are giving a lot but don’t know where the money goes,” she told Devex. For instance on security, the group says donors should support and monitor the establishment of a sustainable independent public complaints facility that will address misconduct by Somali security forces. They should insist on the participation of civil society in the design and oversight of security forces, including the recruitment process to prevent child soldiers. Regarding the justice system, the consortium calls on donors to push for the creation of a Somali Human Rights Commission. And while the country has made some strides in public financial reform, Ndeda stresses they worry whether the government is putting in place the proper structures and systems. 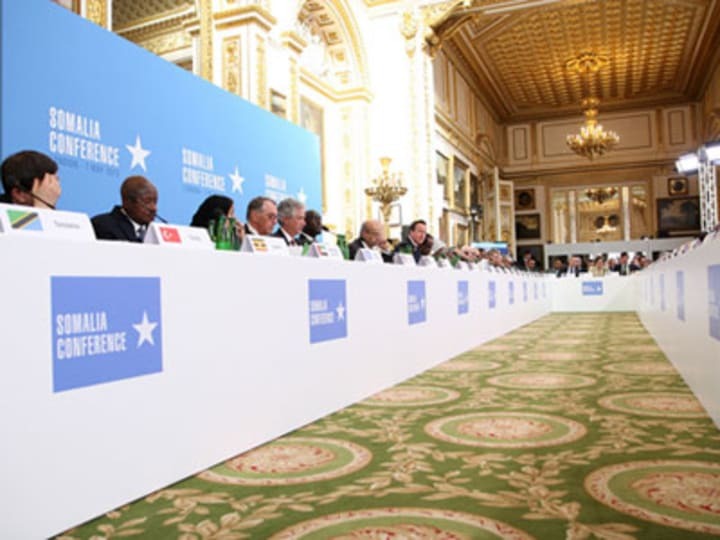 Among the topics expected to be discussed at the London conference is the establishment of a joint financial management group that would oversee funds channeled by donors to rebuild Somalia. Donor funds are currently channeled to a special financing facility which still is being developed, but Ndeda says there is a “lot of trust” for the structure being eyed as the basis for donors’ future engagement in the country. “I think it will need a lot of pressure from the development partners for the Somali Federal Government and Somaliland to seriously considered working with it,” the source suggested. Some donors have started to boost their presence in the country, like Japan, which will be hosting a specific donor meeting on Somalia by the end of the month, or Gulf states that have expressed interest in providing more support, though in this case the consortium raised the need for more transparency in their engagement. Aid coordination is another topic on the agenda in London, and U.K. Secretary of State for International Development Justine Greening was scheduled to do a roundtable meeting with the Somali finance minister and an EU representative on the subject prior to the conference. Aid coordination is an important measure that will guide how donors work in the country. “The last thing that you want is having one donor in one ministry talking about the provision of services and another ministry or another donor with a different model of delivering services,” USAID deputy mission director for East Africa Holly Dempsey previously told Devex. But how this will pan out remains a question at a meeting that will not be attended by representatives from the crucial Somali regions of Somaliland and Puntland. “The current focus in Somalia is beneficial, but it doesn’t have to be at a detriment of other regions. Somaliland and Puntland also need to be engaged in the process,” says Ndeda, reiterating the consortium’s call that all assistance to Somalia should be based on need and not on any political direction or affiliation. Several donors heeded the call. EU development commissioner Andris Piebalgs pledged €44 million($57.65 million) for Somalia’s justice system and police force at the conference. How this will be spent is still unclear though. Experts from the European Commission clarified that the money will still not be channeled through the Somali government. “We might use other channels than UN-NGOs. The exact implementation modality is not yet sure,” they said, an EU spokesperson told Devex. The United States, meanwhile, announced plans to provide $40 million in assistance for the country. It is not yet clear though how the money will be spent.